Zoggs Broken Tide 17 inch Boys swimming shorts feature a distinguished print pattern for the looks, as well as a mesh lining for comfortable fit and support. With 17’’ leg length and an elasticated drawstring waist, the shorts are highly comfortable and optimised for swimming, as well as fun time at the beach. Additionally, they’re made from a super durable Durafeel™ Fabric for impressive chlorine and snagging resistance, it also prevents fading and fit deformation. for submitting product information about Zoggs Broken Tide 17 inch Boys Swimming Shorts We aim to answer all questions within 2-3 days. 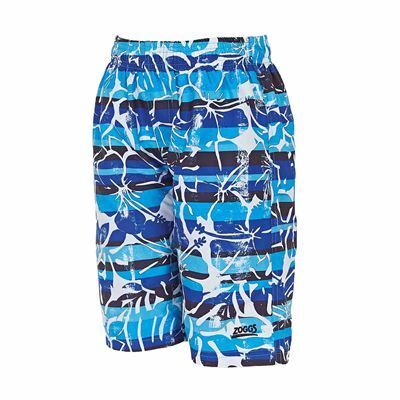 for submitting product information about Zoggs Broken Tide 17 inch Boys Swimming Shorts. We aim to answer all questions within 2-3 days. If you provided your name and email address, we will email you as soon as the answer is published. for submitting product review about Zoggs Broken Tide 17 inch Boys Swimming Shorts.